I began today’s study with the idea of sprockets in my head. I took a picture the other day that had repetitive square figures at the top edge that reminded me of sprocket holes in a roll of film (see Sprockets). Instead of creating square figures, I painted a wavy blue line. The rest of the composition was about the interaction of colors. It is difficult for me to keep my mind from thinking of what the picture means, as I am painting. At one point, I was reminded of stalactites and stalagmites in caves. If I were to follow strict abstract expressionist orthodoxy, I would have scrapped this composition, since it form that can be identified as a figurative element (i.e., stalactites or mountain peaks, etc). I like both the color and the form in this composition. 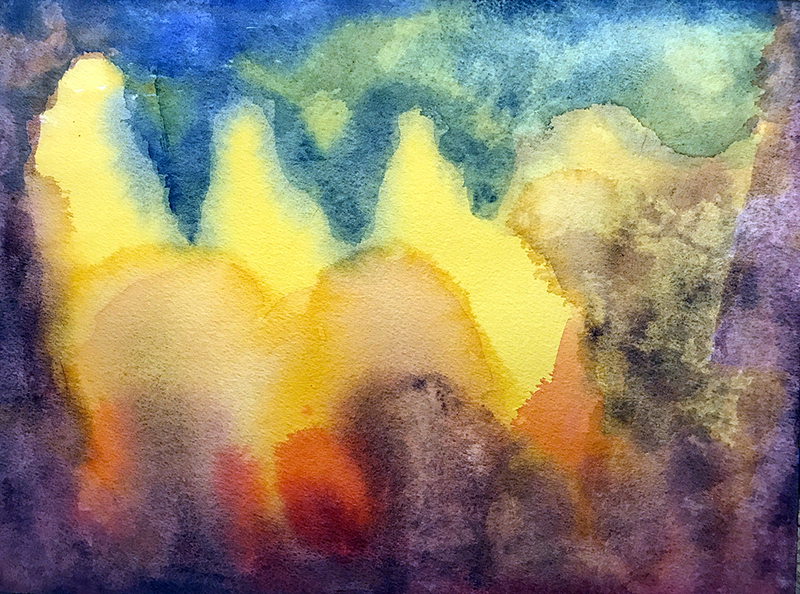 This entry was posted in Personal Stories and tagged abstract art, abstract expressionism, art, artistic process, creative process, creativity, figuration, visual arts, watercolor. Bookmark the permalink. I am glad you didn’t scrap this and shared it instead. I enjoy this painting; it’s uplifting.